Pharma Marketing Blog: Who's in Charge of Your "Invisible" Metadata? WARNING: Don't Invoke the "Invisibility Rule"
Who's in Charge of Your "Invisible" Metadata? WARNING: Don't Invoke the "Invisibility Rule"
My Twitter pals are all atwitter over FDA's recent letter to Novartis citing violative content in a Facebook "Share Widget" that Novartis created (see "Implications of FDA’s Warning Letter to Novartis Regarding Facebook Share Widget" for the back story). At the center of the controversy is "metadata." If you are a pharmaceutical marketer asking yourself, "What the hell IS metadata? ", then you need to read this because some junior web developer on your team (internal or agency side) may be playing fast and loose with your metadata unbeknown to you and your legal/regulatory people. The Novartis letter is a warning that FDA, however, is looking at metadata. Metadata is usually "invisible" content inserted within the header of the HTML code that creates a Web page. This includes a "description" of the page or Web site and keywords. Some of this information is used by search engines to find the page and include a description of the page in the natural search result. BOTH the paid ad and the search result contain content that is written and controlled by Pfizer. The natural search result content that begins with "Learn about..." is exactly the content that Pfizer included in its "description" meta tag within the HTML code for the viagra.com home page. Google just lifted that content. Users cannot control this content, only Pfizer can -- by editing the meta tag. This was exactly the point that the FDA made in its letter to Novartis regarding the Facebook Share widget. That widget includes meta tag content created and controlled by Novartis. It's not content that users of the Facebook widget can change. "Learn about prescription VIAGRA ® (sildenafil citrate), an erectile dysfunction (ED) treatment option that may help your ED." This content is exactly the same content you see in the natural search result above. The problem is that this content is in violation of FDA regulations that require fair balance -- ie, presentation of major risk information -- whenever a pharma company controlled communication to consumers includes a product trade name and its indication. The meta tag does NOT include this fair balance. The lack of fair balance was one of the violations that FDA cited in the Novartis letter that concerned the Facebook widget. 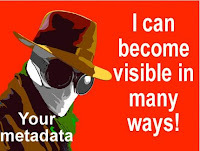 Pharma people have often invoked what I will call the "Invisibility Rule" with regard to metadata. According to the "Invisibility Rule," meta tag content is NOT intended to be visible or read by consumers; its function is to provide information to search engines and improve the visibility of the site in search engines. Consequently, meta tag content should not be regulated by the FDA. The problem with the "Invisibility Rule" is that metadata is not really invisible to consumers searching the Internet or using social media because both search engines and social media make the metadata visible. While many pharma marketers may claim not to know about metadata and who creates it -- it's "too technical for me" may be the excuse -- the metadata content is carefully crafted by someone on the team as is evident in the Viagra.com example. And that content is directed to the consumer; why else begin with the words "Learn about..." and end with the words "...may help your ED."? It is more important than ever that the FDA come out with some guidance relating to this issue, which falls under the heading "Regulatory Solutions to Overcoming Space Limitations in Pharma Social Media Communications" (read more about that here). Without specific guidance, pharma marketers must rely on "received precedent" and the Novartis letter is such a precedent. It clearly warns pharma advertisers that the FDA is looking at metadata content when that content is controlled by the marketer AND becomes visible to consumers as in Facebook Share widgets. It's only a short step from widget to natural search result as in the Viagra.com example above. BOTH make metadata content visible and render the "Invisibility Rule" defense questionable. P.S. Back in the day (prior to 2001) when I worked as a consultant helping pharma companies design and build product Web sites, I had a personal experience with a pharma client who attempted to manipulate meta tag content. Specifically, someone on the client side suggested that competitor product trade names be included within the "keyword" tag of their product's web page in order to "hijack" searches on their competitor's trade names. That is, if someone searched for "Brand Y," the search engine would dutifully offer up the client's site as a result. I pointed out that this may be illegal and certainly was unethical. The scheme was never enacted and I soon found myself out of work as a consultant. (2) It demonstrates how difficult it is to point out that the Emperor has no clothes when you are paid by the Emperor. Good concise summary and example. Great summary, John. Should help clear things up for many people. Just a heads up for those considering "enhancing" their meta keywords in an attempt to hijack some search results. I agree that it's certainly a bit unethical, but may not be illegal. However, if neither of those compel people not to do this then they should know that meta keywords have no impact on search results. They may have at one point, but because of rampant misuse, they are widely ignored by search engines for the purposes of rankings. Thanks for the clarification re keywords, which I suspected was true, but being an oldie I haven't kept up with all the details of how search engines work. nobody really knows exactly how the search engines work ( aside from the guys writing the code for them ) any seo advice you get is to a degree theoretical. The time delay between cause and effect in the world of search makes it very difficult to be 100% sure what change had what effect. Just a point of clarification. Meta keyword tags may not impact search rank, but it can impact the speed at which a new site begins to appear in the search results. Additionally, meta keyword tags remain a great place to list common misspellings of important keyword terms.